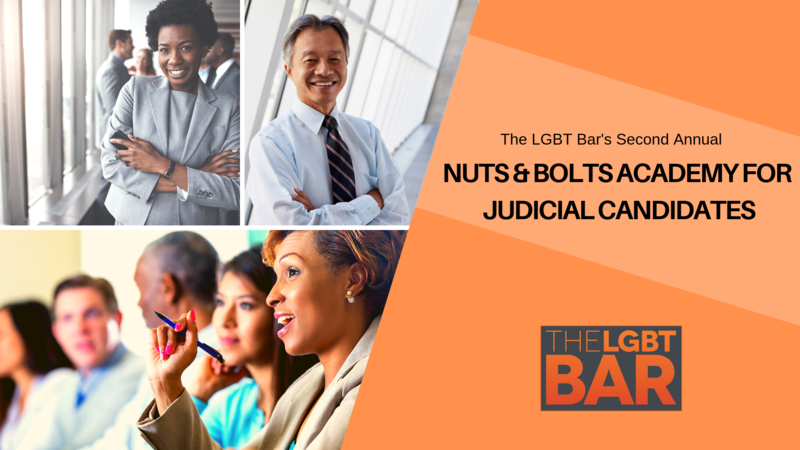 The LGBT Bar’s “Nuts & Bolts Academy for Judicial Candidates” seeks to provide interested legal professionals with the tools they need to end up on the other side of the bench. This intensive workshop welcomes legal professionals from all backgrounds and parts of the country, as the LGBT Bar believes diverse perspectives bring diverse experiences to the bench – and diverse experiences lead to better judgments. The LGBT Bar’s Judicial Nuts & Bolts Academy offers serious candidates planning to seek a judicial position in the next three years – either through appointment or election – with a foundation in those processes, as well as small-group mentoring from current LGBTQ+ judges with experiences in both partisan and non-partisan elections as well as nomination and appointment procedures. Attendees will have significant small-group time with current judges for conversation about the pathway to the specific jurisdictions identified as being of interest, as well as networking time with other prospective candidates. Applications will open on February 1 and close on June 15. We welcome all serious applicants, and particularly encourage attorneys of color, transgender attorneys, attorneys with disabilities, and women attorneys to apply. Current LGBT Bar membership is mandatory for all Academy participants. Please visit our site (https://lgbtbar.site-ym.com/general/register_member_type.asp?) to become a member if you are not one, or to check whether your registration is current. If elected, is this a partisan or non-partisan race? Is there an incumbent expected to seek re-election? Have you previously been appointed to any 'political' position or office? If so, please list. Have you attended any other organizational candidate training (i.e. Emily's List, Victory Fund, etc.)? How do you identify your sexual orientation and gender identity? How do you identify your race/ethnicity? Stay up to date with current LGBT Bar Association news.